Is hip or knee replacement the right choice for you? If you’re thinking about hip or knee replacement, you’re not alone. Statistics from a Mayo Clinic study found that in a 10 year period, the number of people who underwent hip replacement more than doubled to 300,000 people per year. This was an increase of 92% in people 75 and older and 205% in people between the ages of 45 and 54. In addition, approximately 700,000 knee replacements are performed each year in the U.S., with that number projected to grow to nearly 3.5 million by 2030. Before deciding to undergo hip or knee replacement, however, there are a number of important factors you should consider. By learning about all your treatment options and the risks and benefits of each, you’ll be prepared to make a more informed decision and may lower your risk of complications and improve your outcome. This checklist will help you talk with your doctor and gather the information you need when making a decision about hip or knee replacement. Losing weight. Extra weight puts extra stress on both your hip and knee joints, which can cause damage and increase your risk of developing arthritis. Being just 10 pounds overweight, for example, increases the force your knees absorb with each step by 60 pounds. A dietitian can help you make healthier eating choices so you can safely and gradually lose weight. Physical therapy. A physical therapist can help you safely build the strength of the muscles that support your knees and hips through a specialized, supervised exercise program, which can decrease joint pain and improve your mobility. Physical therapists may also offer non-surgical pain relief treatments such as heat, ice, and ultrasound therapy. Medications and injections. Depending on the severity of your joint pain, your doctor may recommend over-the-counter or prescription non-steroidal anti-inflammatory drugs like ibuprofen or naproxen. For some people, cortisone injections may reduce joint inflammation and pain for several weeks. 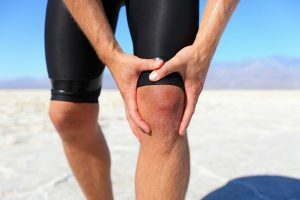 Some studies have found that hyaluronic acid injections may reduce knee pain for some people, although the researchers found that the injections were less likely to be effective for people who were overweight, had severe arthritis, or were older than 65. Am I too young for hip or knee replacement? The concern is that if you get your knee or hip replaced in your 40s or 50s, the replacement joint will wear out or become loose and you’ll need a second replacement when you’re older and may not be as healthy. The decision to undergo joint replacement, however, shouldn’t be made solely on your age. It’s important to consider your pain level and whether your joint problems are preventing you from taking part in your daily activities at home or work. If you do choose joint replacement, there are steps you can take to lower your risk of complications and protect your new joint, such as carefully following your doctor’s post-op instructions and recommendations for rehab, maintaining a healthy weight, and limiting or avoiding high-impact activities like running and jumping or activities that carry a high risk of injury. Am I a good candidate for joint replacement? Several studies have found that the benefit of joint replacement is less for people who were in less pain or who had less limited mobility before surgery than for people with higher pain levels and more restricted mobility. The underlying cause of your hip or joint pain is also important to consider. If the pain is caused by a problem with a nerve or your circulation, joint replacement won’t help. If you decide that hip or knee replacement is the most appropriate treatment for you, a health advisor can connect you with a surgeon who is board certified and fellowship trained, who performs a high volume of joint replacements, and who is experienced in the latest surgical techniques.